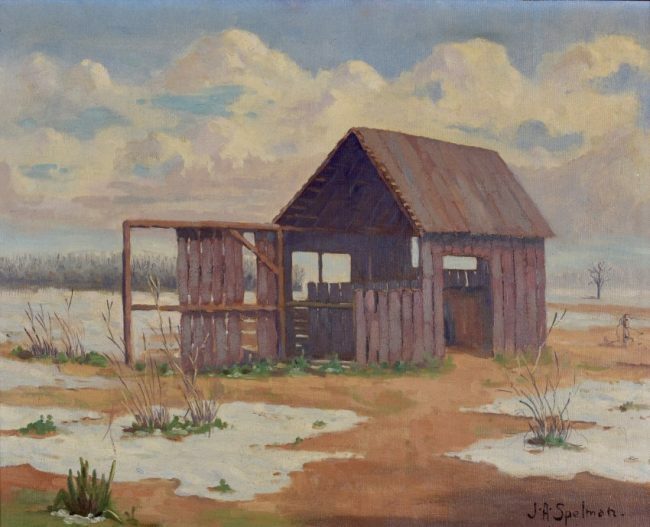 Hiro Fine Art is interested in purchasing artworks by John Adams Spelman. John Adams Spelman was born in Owatonna, Minnesota in 1880. Spelman showed an interest in art at an early age and his family moved to Minneapolis when he was twelve. He attended North High School and later studied at the Minneapolis Museum of Art. In 1900, Spelman and his family moved to Oak Park, Illinois and he attended the Art Institute of Chicago. He studied under the artists John Vanderpoel and Charles Francis Browne. John Spelman spent most summers and some winters in his family’s cabin and his studio on the north shore of Lake Superior close to Grand Marais. Spelman would paint scenes of the north woods in different seasons. Spelman also went on to paint scenes in the Great Smokey Mountains in North Carolina as well as areas around Tennessee. He used a high contrast of light and dark to heighten aesthetic impact. Spelman was a member of the Austin, Oak Park, and River Forest Art League. He was also a member of the Chicago Galleries Association and went on to win several awards and recognition at museums and galleries throughout the country.